I do enjoy a cookalong, so I was delighted when Jenny told me that the Guild of Food Writers was inviting people to join in a Marguerite Patten session, to coincide with what would have been her 100th birthday, today. For logistical reasons, I had to serve my meal ahead of today, but I think that’s allowed. I didn’t do a starter, as I was only catering for the immediate Battenburg family on this occasion and it was a weekday. Not owning one of Marguerite’s books myself, I borrowed the Make a Menu Book from the aforementioned Jenny. The recipes are mostly fairly simple, but they’re really clear and I love the way Marguerite offers suggestions for how to garnish, what accompaniments to serve and, rather fabulously, what to do with left overs – or not: she’s very strict when she feels a dish is not suitable for being repurposed! 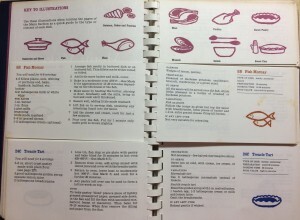 I was very taken by the way each page is split into three sections, so you can indeed Make your own Menu. I made this Fish Mornay, with cod from my local fishmonger Walter Purkis and Sons. This was really lovely, proper comfort food. The sauce was very tasty (it’s basically a béchamel with some mustard and plenty of grated cheese). I slightly defied Marguerite’s serving suggestions and went for carrots, cabbage and crushed potatoes – which we all thought went very well with the main event. For dessert, I made Marguerite’s treacle tart – is it cheating to use pastry that was already in the freezer (homemade, I promise)? Well that’s what I did – not that different from the recipe, only with a lot more butter. I thought the recipe seemed a bit odd, but, in the spirit of the occasion, I followed it. 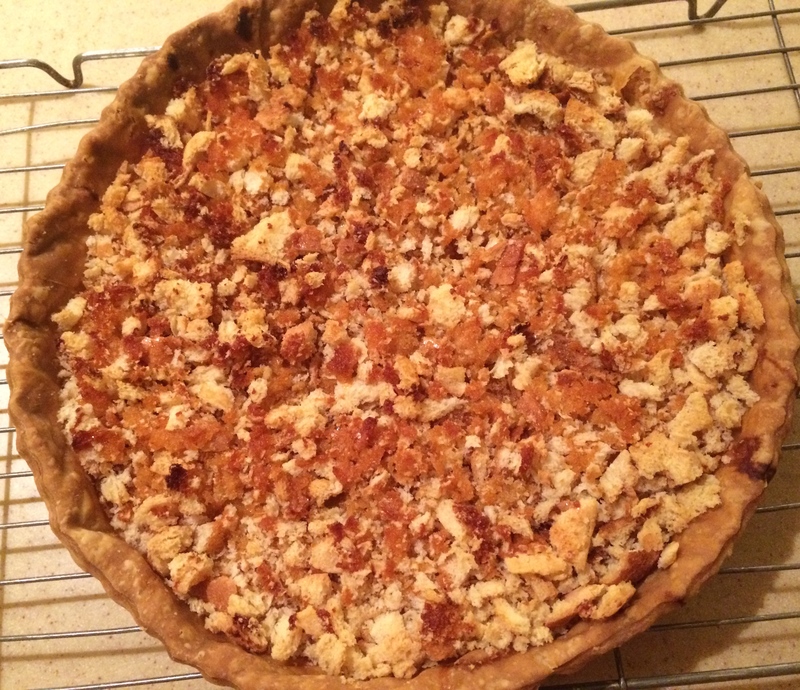 This meant mixing syrup and lemon juice and putting them in the base of the baked tart case, then adding breadcrumbs. I didn’t see how they would mix properly. They didn’t. So it was, frankly, a rather peculiar tart, with the bread being too crispy (forgot to take a photo in all the excitement). But hey, nothing that lashings of creme fraiche couldn’t help with! I would definitely do the fish dish again, but I think I’ll go back to my old favoured recipe for treacle tart next time I decide to do that. Grandma Battenburg has a few Marguerite Patten books, so I persuaded her to join in the fun. She and Grandpa Battenburg had a perfect opportunity when the Colchester arm of the Battenburg family came for a visit during half term. Grandma B chose from her copy of We’ll Meet Again, a collection of recipes from the was years, selected by Marguerite and indeed signed by her for Grandma. 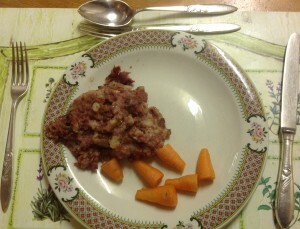 The family enjoyed a (nearly) WWII menu, starting with Marguerite’s Corned Beef Hash accompanied by carrots. This met with all round approval and every plate was spotless at the end. In a slight departure from the brief, they followed with Grandma B’s special Apple Pie (she says she is sure Marguerite’s recipe would be nearly as good!) accompanied by custard, as there was no ice cream in the war. This, also, was extremely popular and Battenburg Boy 1 had two helpings. I apologise now to anyone offended by my nephew’s delightful turn of phrase… but Battenburg Boy 1 said “Grandma Battenburg’s Corned Beef Hash was wicked and her Apple Pie was totes amaze balls. The highlight was the apple pie, though, because the corned beef had a little too much onion and looked a little bit like a turd (no offence Grandma Battenburg). The apple pie was in every way lovely, because the sultanas and the apples mixed together really well and the pastry was perfect (no soggy bottom)”. Battenburg Boy 2 had similar mixed feelings about the Corned Beef Hash which he declared was “awesome and really nice but it did look a bit like baby sick with carrots on the side. I think it had a bit too much onion“. 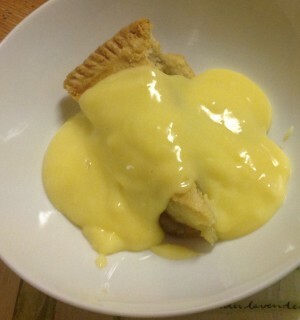 He was unequivocal in his praise of the Apple Pie though: “ssssssssoooooooo nice and it had custard on top ”.